Update: The following is our first bus conversion that we completed in 2010. We have since completed a new bus conversion. You can find the entire process of that conversion on YouTube. 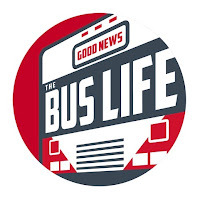 Welcome to the first post from the Good News Bus blog. From here you can see the transformation from school bus to RV. Please feel free to comment. We always enjoy hearing feedback. This is our project. A 1995 International Flat Nose Genesis School Bus with an Amtran Body. It is powered by an International 7.6-liter DT466 Turbo Diesel Engine and has a 4-Speed Allison Transmission. 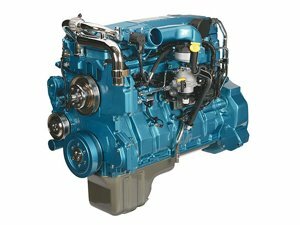 This is an International stock photo for the DT466. I wish ours was this pretty. It only has 110,000 miles on it so it should have a lot of life left. We will be doing a complete change of the interior and exterior. The bus will also be outfitted with full living quarters, kitchen, bathroom. We may end up using this as a tour bus for our band / ministry. It was purchased on ebay for $3000.00. We drove 8 hours to pick it up and 8 hours back all in one day. We were exhausted! We chose to get a bus located in the southern states. This way we would not have an issue with body rust. This bus is rust free for the most part and is in rather good condition. The first step will be to remove all the seats. I will pick out the best two for use as seats in the dinette area. You guys have such cool buses over in the US! the ones in AU are twice the price with half the class....Good job on the conversion! I have read that the most difficulult part of doing a conversion is removing the seats, is that true? @Shawn Reeves I think it only took a day. It is a bit tedious. I have also seen people use an angle grinder to just cut the bolts. That may be faster. Progessive dropped me a couple years ago (I have a 40' 1993 genesis), that is registered as a motor home. I eventually had to get it insured through National General, so far so good! I've been following your trip for some time, the videos of the family are inspiring. I'm interested in a 77 passenger but I like the idea of using murphy beds compared to bunks(twins & full size). Looking forward to taking bikes and things, don't want to pull a trailer.